Why pump by hand if you don't have to? Let the NRS Blast Inflator 12 Volt Pump do the work for you. Its compact size and rugged durability will last for years. This 12-volt pump is capable of inflating to 1.5 psi for a fast and easy inflation. For many inflatable crafts you'll still want to have a hand pump for top off to full pressure and to take along with you on the water. There is a small hole in the pump nozzle. It's there to prevent back pressure buildup that can cause the pump to overheat. 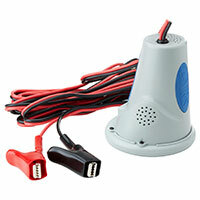 The electrical clamps allow quick and easy connection to your vehicle's battery. Never operate Blast with vehicle motor running - it can damage the pump due to a higher voltage output. Do not block the small hole in the pump nozzle. It is there to bleed off back pressure. Blocking it can cause the pump to overheat and burn out the motor. Using this pump continuously for more than 20 minutes can cause it to overheat. Please allow cool down time between uses.